It is wonderful when you’re walking along in some public place frequented by all sorts of people and you stumble across a little bit of science. Well that’s exactly what happened to Zoe (my girlfriend and science companion extraordinaire) and me on a recent evening in a lively shopping district nearby Caltech. We were strolling along on a balmy summer night when we noticed a crowd on the sidewalk. As we got closer, I recognized what was going on. 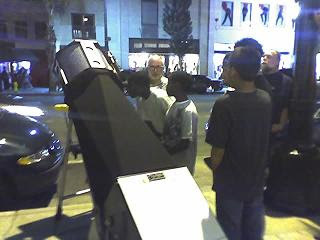 It was the Sidewalk Astronomers group with two large Dobsonian telescopes to delight the crowd. Sidewalk Astronomers is a volunteer amateur astronomy association founded in 1968 by noted astronomer John Dobson. He is the inventor of the Dobsonian telescope. Although based in California, the group has members all over the world. The group designates high-traffic public locations and sets up telescopes to allow the public to gaze upon the heavens. In many cases, it is the person’s first experience in seeing the cosmos through a telescope. On this night, both telescopes had lines ten deep with passersby to view the Moon and Jupiter with three Galilean satellites – Ganymede, Europa, and Calisto. Io had just dipped behind the planet so was not visible. The demonstration impressed many in the crowd. I overheard a group of teenage boys loudly exclaiming after their viewing, “I love Jupiter!” It is nice to see a young person react this way after an unexpected brush with science. Hopefully it will have a lasting impression. This Physics Groupie thinks that Sidewalk Astronomers provides a very useful public educational service at a time when science is not on most people’s mind. Please consider contacting your local Sidewalk Astronomers group to attend a star party, or astronomy program. This group is very worthy of your attention.